Janie Gorman wants to be normal. The problem with that: she’s not. She’s smart and creative and a little bit funky. She’s also an unwilling player in her parents’ modern-hippy, let’s-live-on-a-goat-farm experiment (regretfully, instigated by a younger, much more enthusiastic Janie). This, to put it simply, is not helping Janie reach that “normal target.” She has to milk goats every day…and endure her mother’s pseudo celebrity in the homemade-life, crunchy mom blogosphere. The fresh baked bread is good…the threat of homemade jeans, not so much. It would be nice to go back to that old suburban life…or some grown up, high school version of it Janie was going for normal, but she missed her mark by about ten miles…and we mean that as a compliment. This book was super quirky. It was slow to start, and I thought it was just going to be another YA book about fitting in at high school, then accepting yourself as who you are. And basically, that's what this book is. But for some reason, I generally liked it. The main character, Janie is quirky, but also has her normal moments that I found endearing. She is very easy to identify with, though really childish and naive at times. The story is basically a sweet, innocent, coming of age story that incorporates lots of wacked out farm animals and civil rights heroes. I enjoyed all of the characters in the story. Verbena and Monster were the kind of friends I would want to have in high school and even though both Sarah and Emma can be annoying at times, they played their roles very well and moved the story along quite easily. I really liked that Dowell portrayed real high school kids..not just the stereotypical roles of cheerleaders and band kids and jocks and preps. The way she describes the setting and the characters make you feel like you literally just walked into your local high school in the middle of the school day. There is definitely a "girl-power" vibe in the story. All of the female characters are pretty strong, verging on feministic. It's all about teen girls being thrown head-first into the unknown and having to fight to be happy and get themselves heard. One of my biggest complaints was that it was too short. In fact...it was so short that I am having trouble finding anything to critique...I could have used at least another 100 pages worth of Janie, Monster and the gang. Because the novel was so short, even though you liked the characters, you didn't really get a good feeling of who they were, what motivated them. It's the difference bewteen a simple charcoal sketch and a full blown painting. I felt like the whole book barely skimmed the surface of not only the characters, but the plot. There was really no huge conflict that needed to be resolved. Events in the story just sort of flooded into each other without any direction or purpose. It's weird...I blog and I totally love blogging. But I do have an alias for blogging...and I don't talk about my family or friends really. I like to keep my blog life pretty seperate from my home life. I would probably be mortified if my mom had a blog about the family...especially if people in the community read it. It would be like being on a reality show that played out in my mom's head. I enjoy the spotlight, but not for private home matters. Having a blogging mom like Janie's mom would probably make me really paranoid about what was getting posted about me. I know some children of Mommybloggers probably won't appreciate the pics that their moms posted of their bare bums when they turn into teenagers. I give Ten Miles Past Normal 3 Keys. It was a very fun, quirky, and light read. I do feel that it should be a middle grade level rather than YA. It was almost too childish and innocent to be classified as teen literature. I enjoyed the coming of age part and Janie's growing appreciation of bass and of music in general. This book is good for a quick read if you just want to distract yourself for an hour or two. See you around, I have LOTS of blog stalking that I need to catch up on! I can't wait to check this out - thanks for reviewing it. 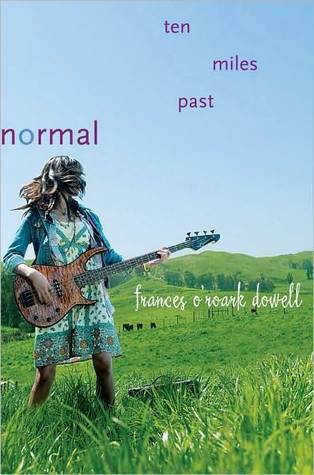 I love Frances O'Roark Dowell and can't wait to check out another great title by her. I am a K-5 School Librarian...do you think it would be appropriate for fifth graders? I really like your review. I for one can't review anything because I'm not quite good with my wordings =). I would love to read this book when I get the chance. Thank you again =). I am going to have to read this. It sounds like one my middle school daughter might enjoy. Love this author, think my sister would really like this, thank you for the review!